My current Giveaway: #Canitforward – One lucky reader will win some wonderful products from Ball Canning! Welcome to a new week of Motivation Monday! Last week, 171 links were shared at Motivation Monday. That’s pretty amazing. 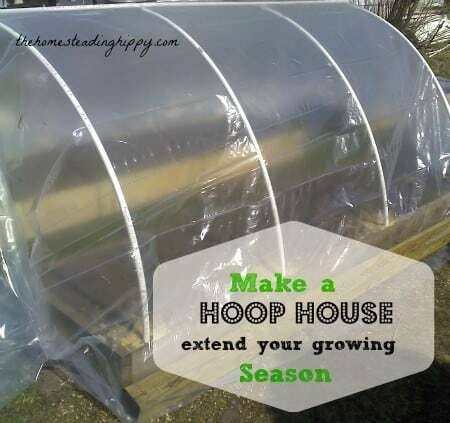 Did you know you can extend your fall growing season with a hoop house? A hoop house keeps the area around cool weather crops warmer and helps protect them early frosts. Fortunately, it doesn’t cost much to make the hoop house; you could probably put it together in one afternoon. Hi Barb! Thanks for hosting! This week I’m sharing Healthy Avocado Fudgesicles. I hope you have a great week! Thanks so much, Barb, for featuring my post! It’s something I’ve struggled with, and I’m sure I’m not the only one. Have a wonderful week! Good evening, Barb. Thanks for hosting the blog party – the features are great! Have a wonderful week! Vickie recently posted..Dear Friends, We Aren’t Crazy! I would LOVE to have a hoop house! I’m hoping to get some kind of a garden in this fall. Good luck! I’d love to hear how you do. Just discovered your linky and love it. Unfortunately, my Internet is acting up so I get the inlinkz forwarder and then get a blank page. I will attempt to look at some of these posts. Thank you! I hope you can get through the next time you try. Thanks for your understanding. I have been able to get through to some posts now. Finally got over here! I linked up a dessert before I remembered it as supposed to be healthy, so we are going to pretend that oatmeal and peanut butter make it healthy! Followed the co-hosts on G+. Thanks! LOL I’ll send the link up police after you with a wet noodle! Glad to see you here! Thanks so much for featuring Arugula! Later today I’ll post about Kale. Greens are awesome! FYI: the links to Katie’s FB and G+ pages listed above actually link to Marie’s pages. I was a bit confused for a minute there. Thank you so much for catching that! I’ll fix the links.